The homeland of Aristotelis, the bigger philosopher of antiquity, schoolteacher of Big Alexandros. 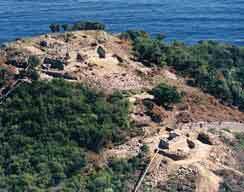 The city was founded by the settlers of Andros, around 655 B.C. After the Persika, the Stageira also became member of the A' Athenian Alliance, while during the Peloponnisian War the city allied with the Spartians, since previously, in 424 B.C. it renegaded from the Athenians. Later the Stageira adhered to the Public of Halkideans, and in 348 B.C. they succumbed to Philippos B'. According to the tradition, the Stageirans transported and buried in their city the bones of Aristotelis and established in honour of him a big feast-the Aristotelian. The excavation researches of the last years from the 'IST E.P.K.A' have brought to light the precocious classic fortification of the city, which is maintained to an impressive degree, various public buildings in the Market (as the Gallery of classic years), an ancient sanctum, a Thesmoforion, residences of classic and hellenistic years, as well as the water supply system of the city.